My green pasta vegetable medley and tomato arugula angel hair pasta were such successes recently, that this week, I decided to do another inventive pasta dish using all the vegetables in the house, plus some high quality chicken sausage. I used the basil that I had picked up at the grocery store the other day to prepare a basic pesto sauce to go along with my pasta creation. I never liked pesto much when I was younger - I always preferred a tomato-based pasta sauce. But, pesto has really grown on me. 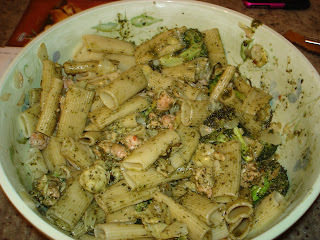 I make pasta dishes with two types of pestos these days: a spicy hazelnut pesto and a basic pesto. Tonight's dish used a basic pesto which is comprised of the following ingrediants: olive oil, basil and pine nuts (also known as pignolia nuts), plus a bit of garlic. I certainly will share the hazelnut pesto recipe in a future post. First, prepare the pesto in your cuisinart, by adding 1/2 cup of the olive oil, 2 cloves of diced garlic, and the pine nuts. Blend fully, until it forms a pesto paste. Yes, pesto is that easy, and the quality of your pesto is dependent on using a high quality extra virgin olive oil, so choose carefully. I used Olive Oil from Round Pond Estate, in Napa. 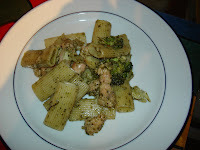 Next, saute the vegetables (onion, artichoke and broccoli) with the rosemary in a tablespoon of olive oil. While this is going on, saute the chicken sausage in olive oil, and add a tiny bit of red pepper flakes (about a quarter teaspoon) if you want to add some spice to the dish. This is, of course, optional and I opted not to go with any heat tonight. Season the vegetables and sausage with salt and pepper. Boil the water to cook the pasta of your choice - tonight I used rigatoni. Mix everything together and enjoy. This is easy to make and doesn't take too long, though it does seem to dirty at least half of the dishes, pots and pans in the kitchen. The great thing about this dish is that it can serve an entire family, or provide for plenty of leftovers!